In this eighth-grade humanities lesson, students make Vegetarian Chili and Cornbread and discuss how cost and access impact food choices. Students debate whether access to food that is good for you, good for the environment, and good for other people is currently a right, a privilege, or a responsibility, and whether it should be. This is the sixth in the Debate Plate lesson series, a six-lesson series that focuses on factors and considerations that influence personal food choices and the impacts of those choices. Explain and give examples of how food access may be restricted. Construct and defend an argument on the question of whether access to healthy, sustainably produced, and socially just food is a right, a privilege, or a responsibility and whether it should be. List and describe a wide variety of considerations they have when deciding what to eat, discuss the factors that influence how they prioritize those considerations, and discuss with examples the role nutritional, environmental, and justice concerns play in their food decisions and whether those roles have changed over the course of the Debate Plate lesson series. Brainstorm forms of food access. Debate the questions of whether accessing healthy, sustainable, and socially just food is a right, a privilege, or a responsibility and whether it should be. Welcome students back to the kitchen. Review overarching questions of the Debate Plate unit: What factors influence your food choices? What impacts do those choices have on your body? On the environment? On other people? Introduce the theme of the day: Cost & Access. Explain that cost and access are slightly different from the other considerations we’ve discussed so far in Debate Plate because while they sometimes might be elective considerations—maybe you really love a good deal, so you choose to buy Kraft instead of Annie’s mac and cheese—other times they are non-elective considerations, meaning you don’t have a choice—you’d really like to buy Annie’s mac and cheese because reducing your environmental impact is important to you and Annie’s uses organic pasta, but that extra $1.25 is more than you can afford, so you must buy Kraft instead. In this case the cost of food has impacted the choice you made, but it’s not by your personal choice. Geographic access: Do you have any grocery stores close to you? What food is available at those grocery stores? How difficult is it to transport food from your source to your home? Cost access: Can you afford a food? Knowledge access: Do you know where to get food or how to grow it? Do you know how to prepare the food you want to eat? Do you know how to prepare the ingredients available to you? Equipment and tools access: Do you have a place, equipment, and tools to prepare food? Do you know how to use the equipment and tools you have available? Do the equipment and tools you have work? Cultural access: Is culturally relevant food available to you? Do you know where to find food that is culturally relevant to you? Transportation access: Do you have a way to transport yourself and your food between the place you get it and your home? Can you afford to pay for transportation? Health/allergy access: Is food that is good for your health available to you? Explain that once you start considering issues of food access and looking at who has access to food, who doesn’t, and why, this raises some very large conversations around justice. These questions are where we’ve been heading all week. They integrate all the topics we’ve looked at in Debate Plate so far. Think-Pair-Share: Do you think that access to food that is good for you, good for the environment, and good for other people is currently a right, a privilege, or a responsibility? Explain that this question asks for some higher-level thinking, and that there are no objectively right answers. Give students some time to reflect quietly to themselves, and then turn to a neighbor to discuss. Finally, bring everyone into a full-class discussion. Ask students to discuss whether they think that food that is good for you, good for the environment, and good for other people should be a right, a privilege, or a responsibility. Thank students for their participation in the discussion. Emphasize that these questions have many answers and that answering them fully may be an ongoing process over the course of a long time. 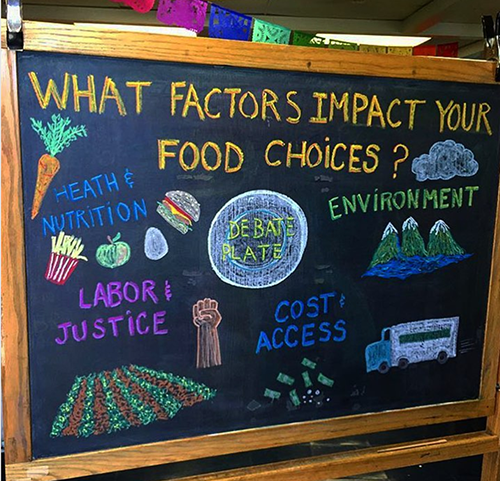 Encourage students to keep digging into these questions because as they have seen over the course of Debate Plate, our food choices have major impacts and connect to almost every aspect of our world. Over the course of a lifetime, becoming informed about the impacts your food choices have and choosing to be intentional about what you eat can create real, important impact. Learning about your food gives you real power to change the world. Small-group check-in: If you could only eat one food for a year, what would you want to eat? Introduce jobs for the day in more detail. Describe how chili can really be made with anything you have on hand. Just like with the spiced red lentils and Indian-spiced coleslaw, we’ll be cooking the chile powder in oil at the very beginning along with onion and garlic to help the depth of the flavor infuse the whole dish. Has there ever been a time when you have wanted to cook something from the ESY kitchen at home but have been unable to do so? What are some barriers that you encountered? These are all forms of access. What are your top considerations when choosing what to eat? Why? Has anything you learned this week stuck out to you, made an impact on you, or changed how you think about your own food choices? What was a main takeaway for you this week? What is something you learned this week that surprised you? What is a question you still have about something you learned this week? What is something you learned this week that made a personal impact on you? As we talk about cost in this lessons, we wanted to share how much we had spent on our meal. We calculated the total cost for one batch of cornbread at $3.05, or $0.31 per serving. The cost for one batch of vegetarian chili was $9.10, or $0.91 per serving. This brought our total cost for the meal to $12.15 per group, or $1.21 per serving. We share that this is just inside our target of $1.25 per student per class. Build in lots of structured pause time for students to reflect on big questions. Many students will feel more confident raising their hands to volunteer to speak after they have had time to process. Name that there are no specific right answers to these big questions. Define “access” early in the Chef Meeting so that vocabulary is not a barrier to participation. Access is being able to get something. Help students brainstorm access and barriers to access by asking them, “What have you wanted to cook from the ESY kitchen and not been able to?” This helps to ground the discussion in their experience. The discussions in the Chef Meeting can surface differences in students’ financial relationships to food. Balance hands-off and more involved facilitation to name and explain when students make statements that are offensive or short-sighted—be ready to disrupt oppressive assumptions and statements. We introduce the terms “food desert” and “food swamp” in this lesson and acknowledge that both terms are controversial because they can cast low-income communities in a negative light. Beans: The chili is especially delicious when prepared with a variety of beans. We used black, pinto, and kidney. If cooking beans from scratch, cook in different pots to accommodate for their different cooking rates. Crispy cornbread crust: Heat the skillet before adding the cornbread batter to the skillet to have a crispy crust. The cornbread recipe involves using the stove to melt the butter and heat the skillet. Many students were confused and thought that the cornbread would finish cooking on the stove as well. Share that when a recipe says to “bake” that means putting it in the oven. Encourage the students to just barely mix the cornbread ingredients. Share that over-mixing creates a tough cornbread while just mixing a little bit will result in a tender texture. Explain that it is fine to have a rough-looking batter. If students leave a lot of dough in the bowl after transferring to the skillet, introduce the rubber spatula as a great tool for getting every last bit. Different kinds of cornbread: Students will be accustomed to a variety of cornbreads. This can be a fun conversation to have. Ask them to talk about the cornbread they are used to and name the differences in sweetness, consistency, amount of corn vs. wheat flour, and the color and grind of corn. Serving with butter and honey: If you don’t wish to serve the cornbread with butter and honey, you can spread some over the top so that every piece has a little bit. Show students how to use a utensil as a cake tester to test if the cornbread is cooked all the way through. If it comes out covered in dough, then it is not finished. Encourage the team working on the cornbread to split into dry and wet ingredient groups to organize and expedite their process. Advise the students working on the wet ingredients to consider what would happen if they were to mix the hot melted butter with the eggs directly. Encourage them to mix the hot butter with the buttermilk first or to let the butter cool before mixing it in. Call attention to the fact that after cooking the dry spices in the pot, some will stick and begin to burn unless you quickly add in some liquid. Share that browning is good but burning will leave an acrid taste. The recipe uses the canned tomatoes as that liquid which quickly releases the spices and cools down the pan. Name this as similar to deglazing. Highlight that cooking the spices in oil before adding the tomatoes is similar to making the coleslaw dressing on Monday and builds the flavor of the spices. We found that a combination of chile powder gave us the best flavor. We used equal parts of ancho and New Mexico chile powders. Many students are skeptical that a vegetarian chili can be delicious but love it once they try it. Soak bulgur in hot water before adding it to the chili to speed up the cooking time. The bulgur adds the familiar texture of ground beef to the chili. It also adds protein and makes the chili more filling. Groups can choose the consistency of their chili by adding bean or tomato liquid or not. Note that it is easy to add more liquid and thin it out but hard to make it thicker. Encourage the whole group to work together on the final seasoning so that everyone will be happy with the level of salt when it is served.